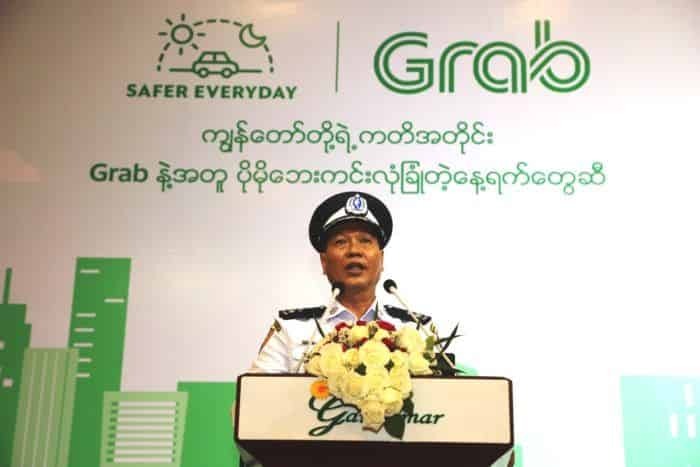 Police Lt.Colonel Thein Oo, Chief of Traffic Police (Lower Myanmar) from Yangon Traffic Police has spoken about road safety and regulations at Grab’s Safer Everyday event. 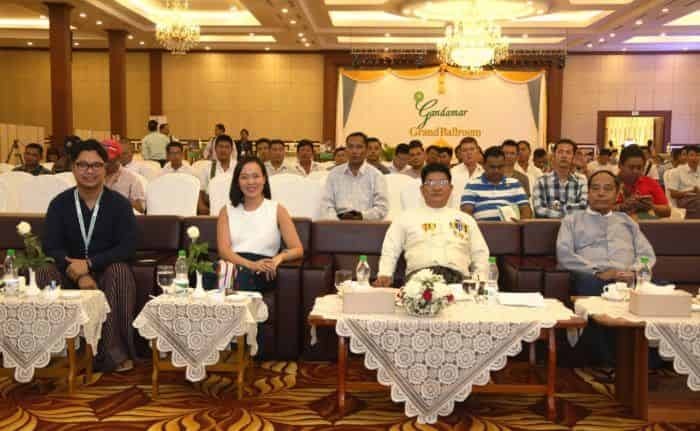 Yangon, Myanmar, 4 April 2019 – Grab, Southeast Asia’s leading super app, celebrated its second anniversary in Myanmar today by hosting a ‘Safer Everyday’ workshop for more than 200 driver-partners at Gandamar Grand Ballroom located within the Gandamar Wholesale compound in Mayangone Township. The workshop, organised by Grab in line with its commitment towards bringing safer rides, featured participation from Myanmar Traffic Police, Myanmar Red Cross and international NGO Samaritan’s Purse Myanmar. 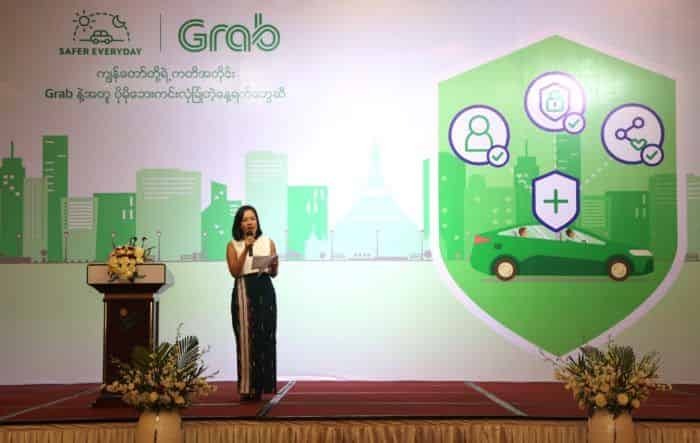 Grab announced its Safer Everyday commitment in Southeast Asia in October 2018 and in Myanmar, it was launched in partnership with Mandalay Traffic Police to host road safety training workshops for driver-partners in Mandalay. As part of this commitment, and as Myanmar looks to celebrate the upcoming Thingyan festival this month, during which people enjoy water play and festivities on the streets, today’s workshop for Grab’s Yangon driver-partners was timely as it focused on equipping them with knowledge around road safety and regulations, basic first aid and CPR training as well as human trafficking. 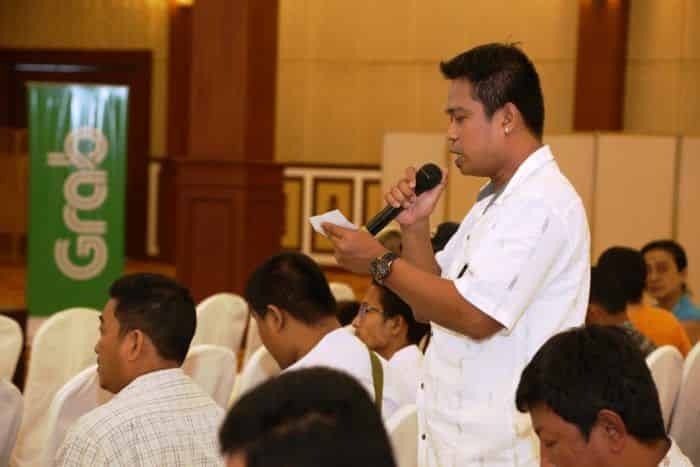 After speeches were shared by Cindy Toh and Dr. Maung Aung, Secretary, Yangon Region Transport Authority, the workshop kicked off with a sharing by Police Lieutenant Colonel Thein Oo, Chief of Traffic Police (Lower Myanmar), about road safety and regulations. This was followed by a presentation about human trafficking awareness and how Grab’s driver-partners can identify suspected cases of trafficking conducted by Samaritan’s Purse Myanmar, an organisation which implements anti-trafficking programmes across Southeast Asia and in Myanmar. The final segment of the workshop saw the Red Cross Myanmar team facilitate a training on basic emergency first aid and CPR. It included demonstrations and hands-on training for driver-partners who gained theoretical and practical knowledge about how to help a sick or injured person until full medical treatment becomes available, along with steps on how to respond to an emergency on the road. Following the workshop, Grab issued 200 fully-sponsored in-vehicle fire extinguishers to the driver-partners. 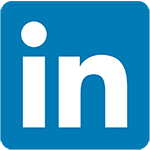 “Over the years that I have been driving, I have experienced instances when I wished I could help people affected by road accidents. 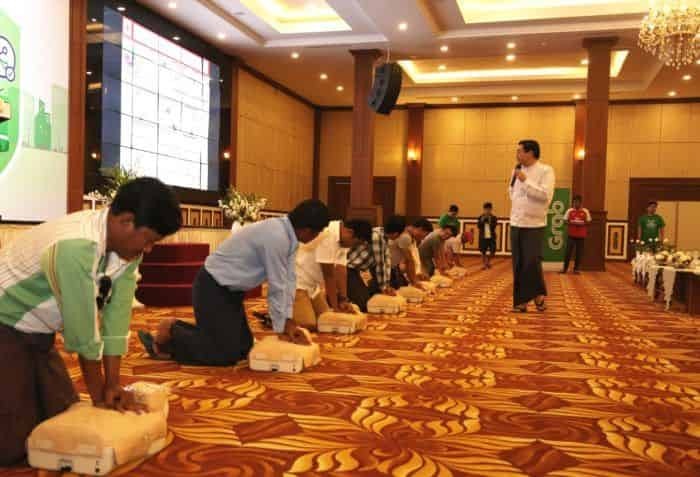 First aid knowledge and skills are very helpful during a time of emergency and I am glad that Grab and Red Cross Myanmar have given us training that help us know what to do in case of emergencies,” said Aung Kyaw Myint, a Grab driver-partner who learned about CPR for the first time at today’s workshop. 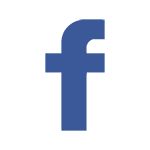 Emergency SOS safety button – Grab sends an automated SMS containing ride details to the emergency contacts when a passenger or driver-partner taps on the button during a ride. The Emergency button which is displayed on the main screen during a Grab ride, also allows passengers or driver-partners to call the police with a simple tap in the event of an emergency. On top of this, Grab provides Personal Accident Insurance for both driver-partners and passengers covering all Grab rides. 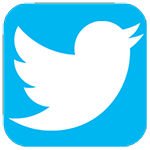 Moving forward, driver fatigue monitoring will continue to be implemented to remind drivers via in-app messages to take a break when it detects that they are potentially tired. 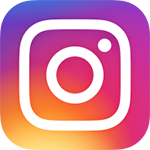 Grab will also be stepping up its Passenger Verification which will require new passengers to verify their accounts using selfies to improve safeguards against crimes for its driver-partners. Ahead of the Thingyan Festival and Myanmar New Year holidays from 13 to 17 April, Grab will host a special celebration with its driver-partners on 12 April. A rest site will be organised at the South Stairway of Shwedagon Pagoda from 6am to 1pm for driver-partners to park their taxis and enjoy a break with refreshments and local snacks served by the Grab Myanmar team. Grab expects a shortage of driver-partners during the Thingyan Festival which is common during the annual celebrations. During the Thingyan Festival, Grab will set up drop-off and pick-up points at key locations throughout Yangon to ensure ease of travel for festival-goers and to ease congestion in the city during the festive period. Grab will also block off specific areas in the passenger application, where heavy traffic and road closures are expected during the festive period, to ensure that passengers and drivers minimise misunderstandings and time spent in traffic congestion.